1. KNOW THERE IS NOT JUST ONE ARABIC; THERE ARE MANY. Arabic is what linguists call diglossic: There’s one form for reading and writing and another form for conversing. The written version (called Modern Standard Arabic, MSA, or fusha) is consistent across the Arab world, while the spoken dialects vary from country to country and region to region. Teachers often don’t mention diglossia at the start—they don’t want to discourage you. But it’s a critical detail that will shape your study. For basic usability, most beginning classes for foreign students are in Modern Standard Arabic. But for natural listening comprehension, you also need to study a dialect early on. I went too far down the MSA-only path at first, and I can now understand only when people speak painfully slowly—or when I’m watching SpongeBob SquarePants, which is dubbed in MSA. Plus, having some dialect will keep native speakers from laughing at you—spoken MSA makes you sound like, yes, a nerdy cartoon sponge. But which dialect? Don’t overthink it; just use your closest personal connections and circumstances. 3. ... BUT DON'T DITCH MODERN STANDARD ARABIC. If you have a good ear for languages, you can pick up the basics of a dialect fairly easily. But if you’re the type of student who needs to see words written to remember them, you’ll have a harder time—there’s a shortage of study materials for dialects. Either way, some facility with MSA is key for fluency in a variety of situations, as it enables you to read magazines and use dictionaries. And once you understand the logic of the language, you can make more educated guesses in dialect. Aside from coffee (qahwa) and algebra (al-jabr), there aren't many English-Arabic cognates. This means you can’t guess at vocabulary the way you might in Spanish or French, and you have to get extra-creative to make the vocabulary stick in your brain. Take the time to match the Arabic to a strange similar phrase, and/or build a weird mental image. The more inappropriate, the better they stick. A G-rated one devised by a friend: Pat your pockets and say, “My fish feel loose” (mafeesh fulus), which means “I have no money” in Egyptian dialect. 5. FLASHCARDS ARE YOUR FRIEND. On the contrary, however, resist the charms of only-in-Arabic oddities you’ll stumble across in the dictionary. Your writing teacher—or anyone else receiving a letter from you—will likely not appreciate your arcane vocabulary. Arabs may be famous for revering poetic expression, but they also appreciate a clear and simple writing style. Particularly when reading newspapers, you’ll find set phrases with very particular meanings. Learn these. To offset the dreariness, load up on fun idiomatic phrases and expressions in whatever dialect you’re studying. Learning a phrase makes you sound more fluent—and it fills up much more conversational space than a single literal word. Bonus: Lots of dialect phrases rhyme, so they’re easier to remember. Al-haraka baraka, as the Egyptians say—all progress is good. 9. ... ESPECIALLY POLITE ONES. Niceties in Arabic go well beyond please and thank you, with set expressions for every possible occasion. Hashak, for instance: As my Moroccan dialect teacher informed me, it’s for “when a bad smell comes out of you.” It’s easy to think you need only one or two such phrases, and turn back to “meatier” vocabulary. But Arabs love gracious compliments (who doesn’t, really? ), and it’s even possible to make a whole conversation out of the phrases. If you don’t have a native speaker nearby, take full advantage of globe-shrinking technology and get a teacher via Skype. Natakallam is a great program, linking displaced Syrian teachers in Lebanon with students all over the world. Bonus: you’ll learn the lovely-sounding Syrian dialect. But approach Google Translate with caution: For English to Arabic, it works just enough to get you started in the right direction. For Arabic to English, it’s hilariously awful and useless. 11. SAY WHATEVER YOU CAN, NO MATTER HOW LITTLE. This applies to any foreign language, of course, but it’s especially true for Arabic, in which all the grammar rules and weird words can easily terrify you into silence. 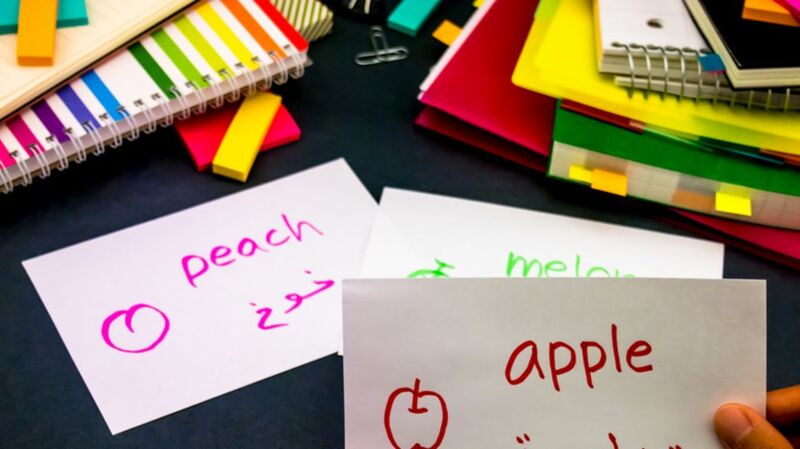 Fortunately, native Arabic speakers are possibly the world’s most enthusiastic supporters of language students. Even a few words will likely earn you praise and encouragement to keep chugging along through the next seven years—or however long it takes.